These tickets are for Sunday only. They do not include accommodation and you cannot stay over night with this ticket. You can however party with everyone else from 10am until the festival ends at 3am. If you are coming / going by bus please note that the bus leaves sharp on the time that is stated. It is your own responsibility to be on the bus, it will not wait for you. ITAV will not be making announcements about the bus. Ever fancied being at a festival, hidden away from the world, in a secluded setting on the edge of the Atlantic… with a roof over your head? 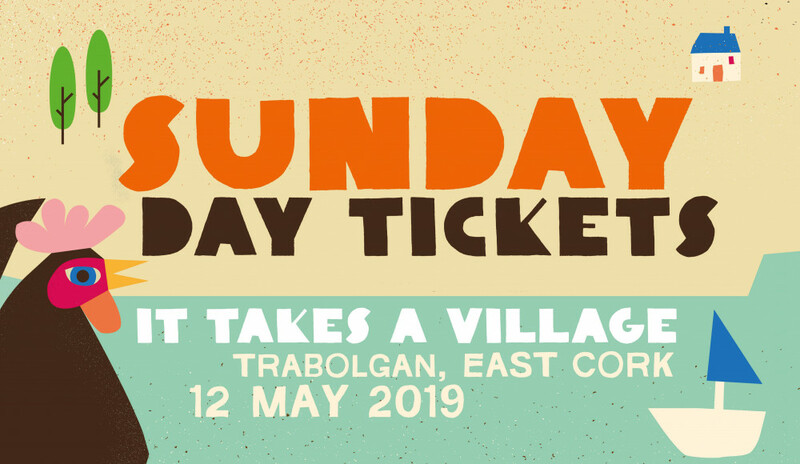 From Friday 10th to Sunday 12th of May, It Takes A Village, once more, drops itself on to the landscape in the idyllic and pastoral surroundings of Trabolgan, East Cork. It Takes A Village is unique in that we offer 150 self-catering houses and apartments, plus 30 fully-serviced campervan sites, contained in Trabolgan Holiday Village. There is no camping in muddy fields here, your booking includes accommodation and unlimited access to the huge variety of entertainment. It’s a residents only affair for the festival weekend, with a limited amount of day tickets on Sunday. Your weekend ticket and booking fees are included in the price of your accommodation, as is access to the swimming pool, pool parties most of the activities on site. There are some things that Trabolgan run themselves which will be extra but any of the organised festival activities are included. By car / van / bike / car pool and we will have a bus running on Sunday from Cork city. If you are increasing your numbers and the other booking option you want is still on sale then yes. You can do this is if you contact us via the contact form above. You will then have to book the larger house before we can refund your other order. However, if people can't make it or you want to downsize then unfortunately this is not possible.